Robust spontaneous rhythms with frequencies ranging from 0.5 to 4.5 Hz exist in in vitro rodent hippocampal slices [1, 2]. These rhythms, which we term spontaneous rhythmic field potentials (SRFPs), are readily observed extracellularly as periodic rises and falls in local field activities (Fig 1, upper panel). Intracellularly, this variation in local field activities manifest as summated postsynaptic potentials (PSPs) (Fig 1, lower panel). 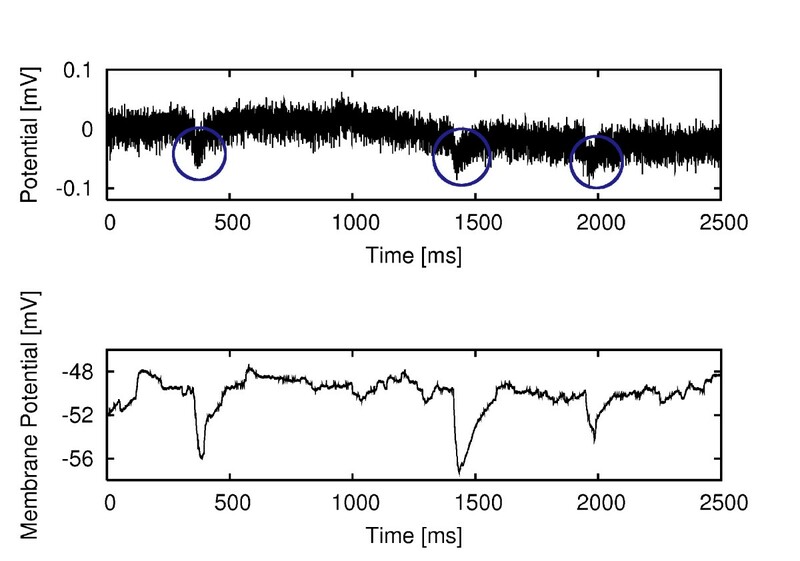 These SRFPs may represent a fundamental oscillatory state that underlies electroencephalographic irregular activities in vivo. Using a combination of cell recordings and mathematical extraction techniques, we have quantified the mean and variances of synaptic conductances that neurons experience during SRFP episodes. Our data consist of simultaneous intra/extracellular recordings of five CA3 neurons and intracellular recordings of one CA2 putative interneuron. We find that the transition from the quiescent (Figure 1, upper panel, parts not circled) to the rhythmic state (Figure 1, upper panel, parts circled) is associated with at least a two-fold increase in inhibitory conductance dominance with inhibitory fluctuations of greater than 10%. Our results are consistent with previous observations that SRFPs are inhibitory-based rhythms. Interestingly, we also find that even the quiescent state for most neurons investigated is inhibitory dominant for a wide range of leak parameters. This latter result is physiologically significant in that the emergence of SRFPs may require a "basal" level of inhibition. In summary, our results provide a quantified basis for understanding the interaction of excitatory and inhibitory neuronal subpopulations in a fundamental hippocampal population rhythm. Simultaneous Extracellular and Intracellular Recordings of Spontaneous Rhythmic Activities. Upper panel shows the extracellular local field potential – Spontaneous Rhythmic Field Potentials (SRFPs) are clearly visible. The illustrated extracellular recording is from the CA3 apical dendritic region so that SRFP deflections are negative (downward). The bottom panel shows the simultaneous intracellular recording from a CA3 pyramidal neuron. The circled regions are examples of SRFP episodes. The injected current value for the intracellular trace is 0.16 nA. This work was supported by NSERC and CIHR of Canada, and by an NSERC Postgraduate Scholarship to ECYH.